Keppel Offshore & Marine (Keppel O&M) through its wholly-owned subsidiary Keppel Singmarine, signed two additional contracts with Stolt-Nielsen Gas B.V. (Stolt-Nielsen Gas), a subsidiary of Stolt-Nielsen Limited, according to their October press release. The vessels will be LNG-powered and capable of LNG bunkering. The signing follows the exercise by Stolt-Nielsen Gas of its options to build two additional small-scale LNG carriers worth a total of around S$105 million (USD 77 million). 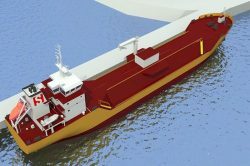 Similar to its preceding two units, the two LNG carriers will each have a capacity of 7,500m3, and come equipped with dual-fuel engines that can run on both diesel and LNG. To be completed in 4Q 2020 and 1Q 2021 respectively, the carriers will have a class notation for bunkering which enables the provision of LNG bunkering services if required.